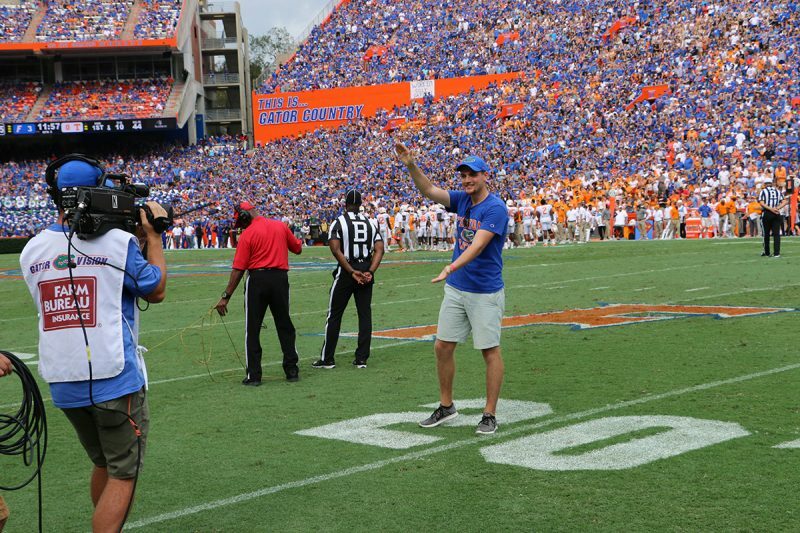 One lucky UF Online senior watched the gripping UF v. Tennessee game in person thanks to the University Athletic Association’s My First Chomp in the Swamp contest. Jackson Kewitsch, a Sport Management major, flew in from Minnesota to watch the Gators play in the Florida Stadium for the first time. Here, he recounts what it was like to watch the orange and blue victorious. “Hail Marys are not often that successful … at least, not when you are outside of The Swamp. However, this past weekend the Florida-Tennessee game was in Gainesville and I was beyond fortunate to be a part of the tradition. Having won the My First Chomp in The Swamp contest, I did not truly know what to expect from my first trip down to campus and Florida in general. I have lived in Minnesota my entire life and was already acclimating to the fall weather rolling in, so walking out of the plane on Friday was a hot and pleasant surprise! This weekend provided me with some of the most memorable and amazing memories I will ever have. A lot of it stems from the generous hospitality, charm, and genuine kindness of everyone in the community and those involved with making the weekend a success. A few of the most memorable moments, however, had to have been networking with other students and professionals in the sports industry and getting to meet the professors I have had over the last two years as a University of Florida Online student.